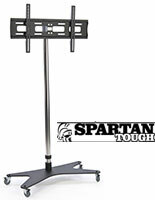 These Quality TV Stands For 52" Television Mounts Hold Heavy Displays! Several On-Site Warehouses are Fully-Stocked for Fast Shipment! 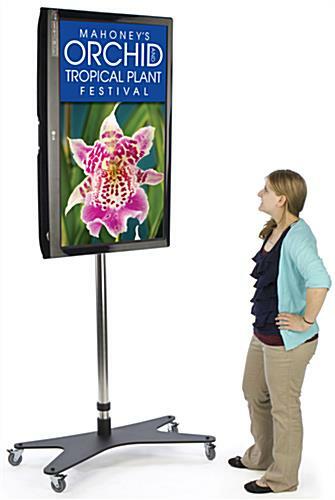 These Affordable TV Stands are Mobile Trade Show Presentation Units! Do you know where to buy TV stands for 52" flat screen TVs online? Visit our website, which is backed by a real company! This LCD display is transportable to and from events with ease. Once in a desired location, the casters lock to stabilize the unit. 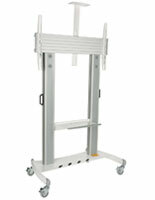 The flat panel racks, heavy duty TV stands with wheels that are height adjustable have a VESA compatible bracket. This mount holds 37" to 60" televisions that weigh up to 176 lbs. These portable heavy-duty TV stands with wheels are designed to mount a monitor in portrait (vertical) orientation only. The long arms of the bracket will be visible if a screen is in landscape (horizontal) orientation. The heavy-duty TV stands with wheels that are found at trade shows are a perfect way to promote your business using a flat panel monitor. The adjustable bracket allows your screen to be placed at different heights to offer the best display!